Several months ago my college roomie, Emily, confided in me that she was pregnant! I was so excited for her, and immediately started thinking about how kind of quilt I would make her. Emily loves video games, especially Zelda. She has the triforce tattooed on her back and I have witnessed many crazy discussions between Emily and my husband about each new Zelda game to hit the market. I knew that Emily's husband had similar interests, as he and Emily actually met at a Comic Con! 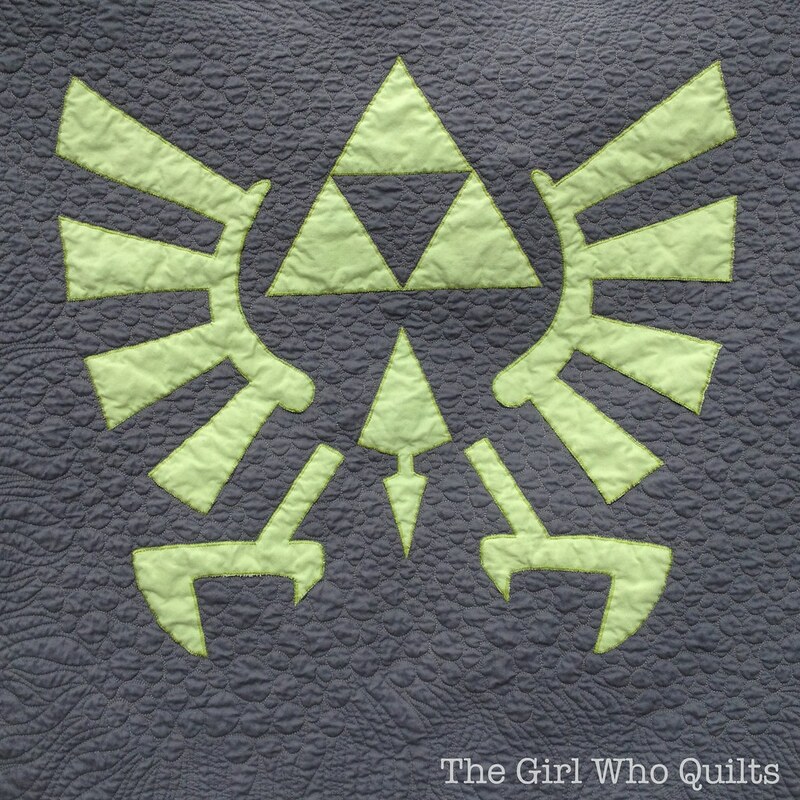 I had to create a Zelda-inspired quilt for Emily...I thought about simply using the triangles as inspiration, but I really liked the idea of appliqueing the full image of the triforce onto a solid background. I wanted to use a grey solid for the background, and either pale pink or pale green for the applique. As soon as Emily announced that she was having a boy, I picked out my fabrics! Usually if I needed a graphic enlarged for a project, I would ask Emily to help me out. 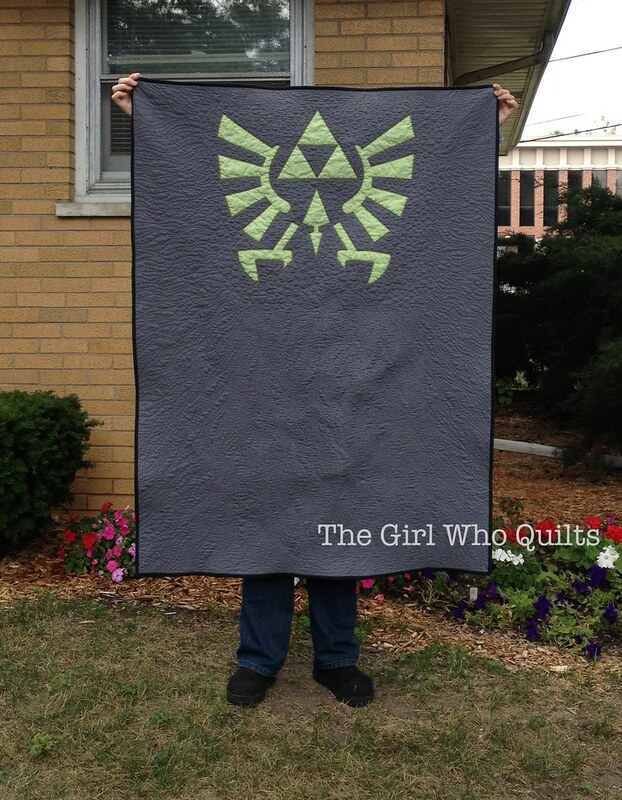 That wasn't an option for this quilt, so I actually drew the triforce myself. The dimensions aren't quite right, but I think it's close enough! 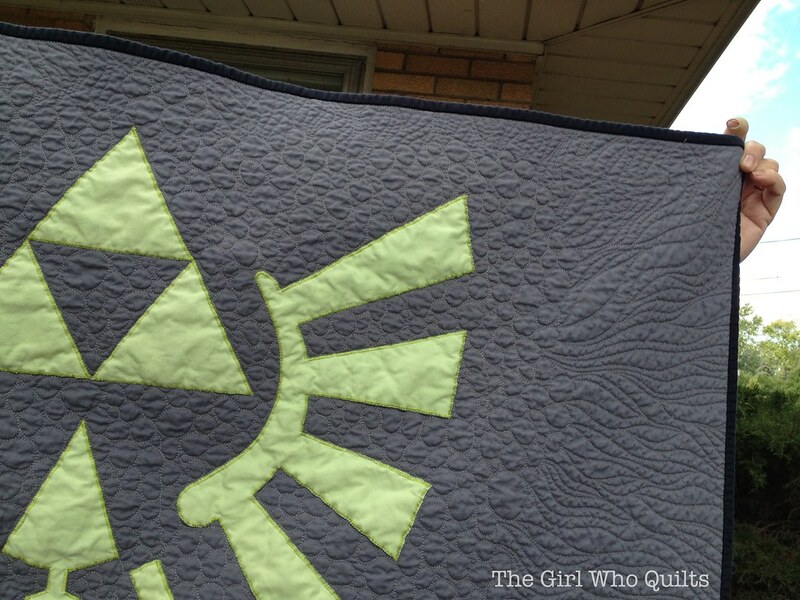 I played around with the quilting a bit, too. I wanted the pebbles to trail off in various directions, but as I was quilting I tended to smooth out the edges. 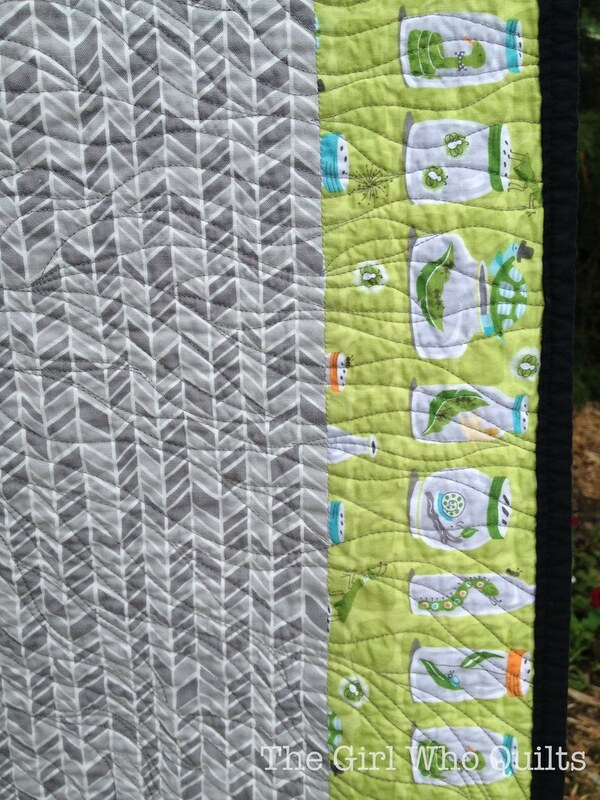 From the pebbles I quilted wavy lines that extended to the edges of the quilt. This was so fun to quilt, and I learned a lot in the process. 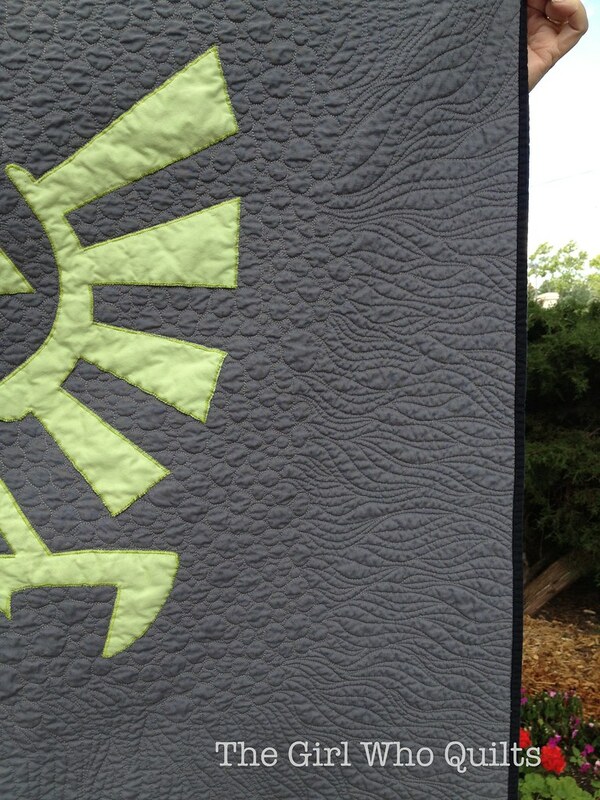 The binding is a very dark grey solid; I love the look of the dark binding as a frame around the quilt! While I was visiting my family in the Chicago area this summer I had lunch with Emily. She loved the quilt so much, and showed me that the colors even match the nursery! On the wall of the nursery, she had hung a yellow "L" (which I assumed stood for the baby's first name). Emily even painted a tiny little triforce in the bend of the "L", in a green color very similar to the green in the quilt! Linc decided to make his appearance the day after I left, but I've seen photos and he is adorable! I can't wait to see him in person!